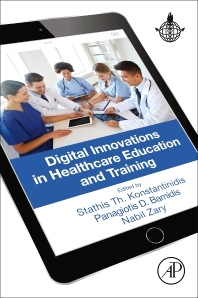 Digital Innovations in Healthcare Education and Training discusses and debates the contemporary knowledge on the evolution of digital education, learning and the web and its integration and role within modern healthcare education and training. The book encompasses topics such as healthcare and medical education theories and methodologies, social learning as a formal and informal digital innovation, and the role of semantics in digital education. In addition, it examines how simulation, serious games, and virtual patients change learnings in healthcare, and how learning analytics and big data in healthcare education leads to personalized learning. Online pedagogy principles and applications, participatory educational design and educational technology as health intervention are bridged together to complement this collaborative effort. This book is a valuable resource for a broad audience, both technical and non-technical, including healthcare and medical tutors, health professionals, clinicians, web scientists, engineers, computer scientists and any other relevant professional interested in using and creating digital innovations for healthcare education and training. Assistant Professor Stathis Konstantinidis holds a PhD in Medical Sciences focusing on Medical Education Informatics from Aristotle University of Thessaloniki in Greece. He received his bachelor Degree in Computer Science from University of Crete, Greece, in 2004 and his MSc in Medical Informatics from Aristotle University of Thessaloniki, Greece, in 2007. He has over 10 years’ experience on EU, National (Greek) and interregional funded projects serving from different roles including project and technical manager and project coordinator. He has published 1 book, 10 book chapters, 10 journal papers and over 30 peer reviewed conference papers. From 2006 until 2011 he was teaching at Technological Educational Institute of West Macedonia, Kozani, Greece. At the same time he was a research associate at the Aristotle University of Thessaloniki in Greece (2005-2012). He was a researcher (2012-2015) for more than two years at the Northern Research Institute (NORUT) based at Tromso, Norway, where he was the project coordinator of CAMEI (FP7 - CSA) (www.camei-project.eu). He served as the OKFN Norwegian Ambassador (2013-2016) and he is a member at large of the Global Healthcare Workforce Council (GHWC). He co-organized many special tracks in different conferences and co-chaired the 2nd International Conference on Medical Education Informatics (MEI 2015) and the CAMEI Summer School. His research includes among other social networking, collaborative e-learning, social media, content sharing, retrieval and repurposing, educational standards, medical education informatics, virtual patients, linked open data, semantic web, serious games, gamification, and eHealth. Panagiotis Bamidis, Associate Professor of Medical Education Informatics, leads the research teams of the Lab of Medical Physics. He has been the coordinator of large European projects (www.meducator.net; www.longlastingmemories.eu, www.epblnet.eu, www.childrenhealth.eu,) as well as the principal investigator for a number of national and international funded projects (more than 30 in total). He is currently coordinating a H2020 project SmokeFreeBrain (www.smokefreebrain.eu) aiming to address the effectiveness of a multi-level variety of interventions aiming at smoking cessation. His research interests are within technology enhanced learning (semantic web, big data, web2.0, serious games, virtual patients) and Affective and Physiological Computing and HCI. His publication record consist of more than 80 international refereed journal papers, and over 250 international peer reviewed conference papers, as well as several book chapters / edited conference proceedings volumes and over some 480 citations. In addition, he has been acting as a referee in more than 20 journals, and as Guest Editor in more than 12 journal special issues. He is a board member of the Greek Federation of Alzheimer's Associations, the Society of Applied Neuroscience, the Greek Association of Space Medicine Research, the Open Knowledge Foundation, and past member of the Alexander Innovation Zone of Thessaloniki, GR. He is currently a president of the Hellenic Society for Biomedical Technology (ELEVIT). He has been the Chairman/Organizer of seven international conferences (iSHIMR2001, iSHIMR2005, MEDICON2010, GASMA2010, SAN2011, MEI2012, MEI2015) and the Conference Producer of the Medical Education Informatics Conference Series (MEI2012, MEI2015) as well as Web Technologies for Medical Education Spring School Series. In 2009, he was awarded the Prize of the AUTH Research Committee for the Best Track Record in funded research projects among AUTH young academic staff. In 2015, he was awarded the title of the Honorary Professor of Karaganda State Medical University, Kazakhstan, as well as the Pospelov Medal for his contributions to Medical Education development by the same University. Nabil Zary received both his MD (1992) and PhD (2007) from KI and his thesis work focused on medial simulation. Dr. Zary is Associate Professor of Medical Simulation and eLearning. He is the director of the Laboratory for Emerging Technologies at the Department of LIME at KI. He is also Visiting Associate Professor at the Lee Kong Chian School of Medicine in Singapore, a partnership between Nanyang Technological University (NTU) and Imperial College London. He further serves as a senior consultant at Collège des Hautes Etudes en Médecine. Dr. Zary has served as coordinator of the Karolinska Institutet edX MOOC initiative (KIx) at edX, as well as the Compulsory Introduction to Doctoral Education at Karolinska Institutet. He is the former founding director of the Centre for Learning and Knowledge (CLK) at KI and the technical director for the Wallenberg Global Learning Network (Stanford). Dr. Zary has a long experience of international projects and supervises postgraduates (currently 6) focusing on e-learning and e-health research and innovation. He is the main author of 60 scientific publications and 80 conference presentations. Dr. Nabil Zary is currently leading the European branch of the ANSI accredited MedBiquitous standardization initiative.